As a health-conscious home cook, I’m always on the lookout for subtle ways to add nutrients and cut calories in recipes. Don’t get me wrong; when something is splurge-worthy, I go for it. (No fat-free cheese that doesn’t melt on top of my huevos rancheros, thank you very much!) And the conventional wisdom on fats has evolved; even high-calorie animal fats are now thought to be good for us in moderation. But if I have the chance to boost my meals with some simple food swaps, I go for it. Some swaps are more obvious than others. The virtues of whole grains, for example, have been extolled by nutrition experts and the media so much that I’m afraid to eat any food that’s white in color. But there are plenty of sneakier ways to enhance the health benefits of the foods you cook and eat. Here are eight of my favorites. #(clear n1). Mustard instead of mayo. My fridge is full of mustards: whole-grain mustard, honey mustard, Dijon mustard, Champagne-shallot mustard. But I use all of them, and that’s because this versatile condiment is so much more than a sandwich spread or a hot-dog topping. While the eggs in mayonnaise are no longer considered evil, the calorie content in the condiment can be impressive. A tablespoon of mayonnaise has 90 calories and 10 grams of fat, while a tablespoon of tangy mustard has just 15 calories and 0 grams of fat. Mustard is essential for making salad dressings, marinades, and sauces, and it tends to thicken with vinegar or lemon juice enough so that only a small amount of oil is needed. When I’m making tuna and crackers or a tuna-salad sandwich, I mix the tuna with mustard instead of mayo (or a little of each), and add in some chopped onion and shaved carrot for texture. #(clear n2). [%image reference-image float='clear right' width=400 caption="Farro (right) is more nutritious than risotto rice (left)."] Pearl barley or farro instead of risotto rice. Risotto’s creamy texture typically comes from the special rice used, but pearl barley and farro do a good job of mimicking it, while adding vitamins and minerals as well as soluble fiber. Bonus: Unlike risotto rice, which requires constant stirring, pearl barley and farro are low-maintenance. Simply add liquid, bring to a simmer, cover, and come back about 40 minutes later. 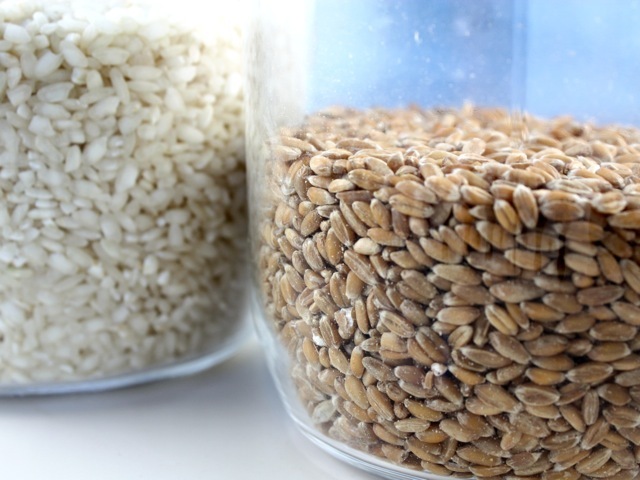 Barley and farro are also great in soups, salads, and side dishes. Sometimes I’ll make a batch of barley for the week and reheat a bowl for breakfast with a sprinkle of cinnamon and some sliced almonds. #(clear n3). Plain yogurt instead of sour cream. Two tablespoons of sour cream have 60 calories and 3.5 grams of saturated fat. By comparison, nonfat plain yogurt has just 13 calories and no saturated fat — and with its tangy flavor and creamy consistency, it’s a convincing stand-in for sour cream. Look for a nonfat yogurt made with as few ingredients as possible (such as that made by Straus Family Creamery), or get serious and make your own yogurt at home,  in the oven or with a yogurt maker if you like. Try yogurt in dips and sauces, stirred into soups, or on top of chili or a baked potato. If you’re using yogurt in a warm dish, just be mindful to cook it at a lower temperature so that it doesn’t break. Schantz also swears by puréed nonfat cottage cheese (again, try making your own) as a substitute for sour cream, mayo, and even the ricotta cheese in stuffed pastas and lasagna dishes. Keep in mind, however, that the purported health benefits of choosing skim milk over whole milk are hotly debated. So if you're really jonesing for the richness of sour cream, go for it; after all, like yogurt, it's cultured with beneficial enzymes. #(clear n4). Tofu instead of mayo or creamy cheese. While firm tofu works well as the star of the show for stir-frying, sautéing, and grilling, soft or silken tofu can be a subtle substitute for mayo and high-fat dairy in dips, sauces, dressings, spreads, cream-based soups, and more. It contains no cholesterol and is low in calories and saturated fat, and it’s a great way to add lean protein and calcium to your diet. If you're trying to steer clear of genetically modified foodstuffs, be sure to buy organic tofu, as the non-organic kind is likely to be GM. And for the lowest calorie count, buy light tofu. #(clear n5). Ground poultry instead of ground beef. I’ll say it: Nothing compares to a juicy beef burger. But in chilis, lasagnas, meatballs, soups, and other recipes with big flavors, lean ground chicken and turkey hold their own. (Italian-style is especially flavorful.) Lean chicken and turkey have significantly less saturated fat than conventional beef, and they’re both rich in protein, niacin, and vitamin B6. Of course, if you buy grass-fed beef, the comparisons change; because grass-fed beef is very lean, its fat content drops down to a level similar to that of poultry. #(clear n6). Applesauce instead of oil. When baking, use unsweetened applesauce to replace half of the oil or butter called for in a recipe. For oil, the conversion is one-to-one; for one stick of butter, use half a cup of applesauce and three tablespoons of canola oil. Schantz says that other fruit purées have the same effect; she suggests using mashed bananas or pumpkin purée in baked goods such as quick breads. Not only are you reducing fat with this swap, but you’re adding fiber, vitamin C, and flavor. And when you cut back on vegetable oil, you cut down on your intake of omega-6s; these are good for us in moderation, but most Americans eat far too many of them. #(clear n7). Sweet potatoes instead of white potatoes. Although white and sweet potatoes are comparable in calories, carbohydrates, and protein, sweet potatoes bring a few extras to the table. They have more fiber, vitamin C, and vitamin A in the form of beta-carotene, and since they have a low glycemic index, they’re absorbed more slowly and keep you full longer. Satisfy your French-fry craving by baking sweet potatoes cut into strips with a little olive oil and kosher salt (the thinner the strips, the crispier they’ll get), or top a baked sweet potato with fresh lime juice for a light lunch. #(clear n8). Kale chips or popcorn instead of potato chips. You’re never going to mistake a kale chip for a potato chip. But if you’re looking for a healthy crunch to go with your sandwich, kale will fit the bill when baked with a teaspoon of olive oil and a bit of salt. Popcorn is another smart snack. Cooked without oil, one cup has only about 30 calories, and because popcorn is a whole grain, it’s a great source of fiber. To heed Schantz’s warning that “adding a ton of salt, cheese, or butter will alter the health benefits” of popcorn, try topping it with a little chile powder and sea salt, or — my favorite — grated Parmesan and crispy sage. Researchers at the University of Scranton in Pennsylvania also recently reported that air-popped popcorn has even more antioxidants called polyphenols than fruits and vegetables. It’s not yet clear how many of these are absorbed by the body, but it's another reason to get your pop on. p(bio). Erin Gibbons is a Chicago-based writer and editor, enthusiastic home cook, and novice urban gardener.